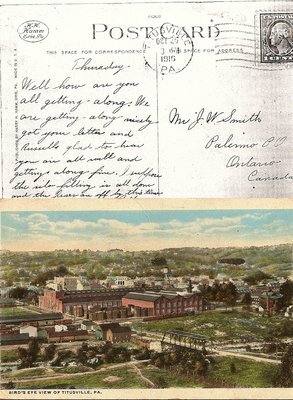 This postcard was sent by Arthur Smith to his father, Walker Smith, in 1916. Arthur is referred to in a family history as a seaman but in 1918, he took over the family farm in Palermo which was at Lot 34, Concession 1, South of Dundas Street. Front of postcard: Bird's Eye View of Titusville, PA.
Verso: Post Card ; H.H. Hamm Erie PA ; Published by Harry H. Hamm, Erie, PA. Made in U.S.A. ; This space for correspondence ; This space for address. The stamp is a U.S. Postage 1 cent and it was stamped at Titusville, PA, October 26, 3 p.m., 1916. The card is addressed to Mr. J.W. Smith, Palermo, PO, Ontario, Canada. John Walker Smith, b. August 31, 1854 in Palermo, Married Victoria Keturah Inglehart on October 26, 1881 and died in Palermo on August 28, 1858 ; Arthur Albert Smith, b. December 6, 1883 in Palermo, married Mabel Lizella (Bridgman) on March 20, 1920 and died in Palermo in 1970.